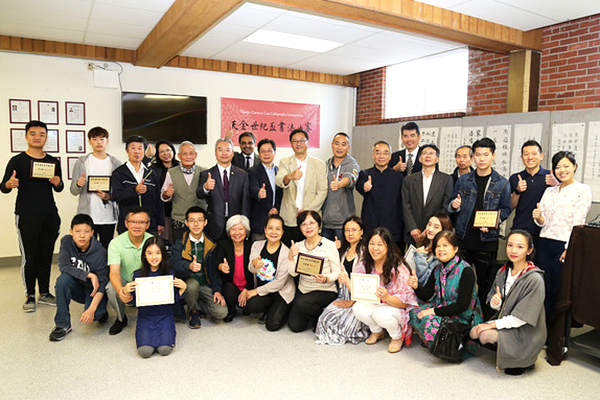 The first ever Tian-Jin Century Cup Calligraphy Competition was held in partnership with the Rotary Club of Vancouver Centennial at Tian-Jin Temple in September 2016. With over twenty contestants between the age of 10 and 80 attending the first competition, the annual event, held typically in the fall, attracts aspiring Chinese calligraphy artists from the community. Contestants compete for monetary prizes and receive live feedback from a professional panel of renowned calligraphy teachers. All aspiring calligraphy artists are welcome to enter. Different Chinese calligraphy styles are accepted. All contestants must bring photo identification (e.g., Driver's License) with them to the event on Sun Sep 15, 2019. All contestants must bring their own brushes and calligraphy sets. All contestants will be provided with the same paper for the competition. They are not permitted to use their own paper. Once the calligraphy topics have been announced, contestants are not permitted to consult written or online resources during the competition. All works must be signed by the artist. There are no rules around calligraphy font styles; however, all must be handwritten by the artist. All contestants must complete the registration forms accurately with personal details. Failure to submit correct details may result in removal from the competition. Please bring photo identification (e.g., Driver's License) to the event. All contestants agree that the organizer has ownership of their work created during the event, with the right to publish, display, and use as promotion, without notice or renumeration. The organizer may change the event details at any time, but will post the updates on this webpage and notify registrants. The panel of judges will consist of experienced calligraphy artists selected by the organizer. Each group will receive three primary awards and additional honorary titles. At the end of the competition, a review meeting will be held by the judges. The results of the competition will be subject to the final decision of the review. Results of the competition will be published on the Association's website (www.tianjintemple.org), and winners will be notified directly at the end of the event. The awards will be handed out at the end of the event in Tian-Jin Temple. The top calligraphy works will be displayed throughout Tian-Jin Temple following the event.